When it comes to getting your CISSP certification, I have one important word for you: STUDY. Study in the car (preferably not while driving), study at work (taking care to not get fired), study at home, study everywhere you get a free moment. Study before training, study after training. You really cannot study too much when it comes to this monster of an exam. The CISSP is the one certification that I tell people that they really should have at least a month of studying under their belt before attending a training session. The reason I say this is because of the sheer enormity of information that is covered in the domains of the CBK (Common Body of Knowledge) for the CISSP. We’ve all heard the description of the information covered in the CISSP as being many miles wide and only a few inches deep. This is absolutely true. You need to know a little bit about a LOT of topics. The CISSP course is not one that you should come into without preparation and expect to pass the exam on the last day. If you take this approach, success is doubtful. The more studying you can get in beforehand, the more rewarding your efforts are likely to be. It is a good idea to go into the class with questions prepared and with the idea that the course will be a last review for you before pushing through with the actual exam. In addition to knowing the concepts, real life experience does come into play with this cert. The prerequisite experience of 5 years in IT/IA should be heeded. 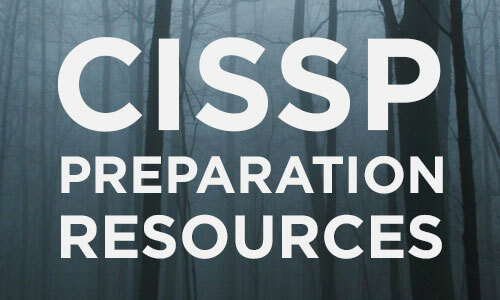 Everyone prepares for exams differently, but we wanted to share some of the resources that our clients have shared with us that helped them along the way to studying in addition to taking our CISSP training course. Clement and his colleagues have put together a very useful quiz engine and other materials. The price is nominal in comparison to the value that you get from this. We include a subscription to the CCCure’s practice exams with every enrollment. It includes multiple choice questions, scenario-based questions as well as interactive drag-and-drop/hotspot questions; the same questions formats you will find on exam day. Even though this book is geared towards the 10 domain test that has been retired, this is an excellent book to aid you in your studies. The changes made to the CISSP domain and exam structure were more organizational than material-based. While some new content has been added to the exam the relevance of the material in Shon’s book is still there. Because Shon Harris passed away in late 2014 an updated 7th edition that reflects that new exam objectives has been delayed until at least May/June of 2016. A new author (Fernando Maymi) has picked up where she left off and we will have to wait until mid-2016 to see if this book remains our favorite prep book. This is one of two books (the other one being from ISC2) that are available right now that covers the newest version of the exam with 8 domains. We have found, along with our clients, that this book is the better of the two. ISC2’s book endeavors to be a reference more than a tool for exam prep. We have found it to be unnecessarily verbose in some places and oddly disjointed in others. While you might expect a book from the actual exam owners to be the standard against which others books are measured, it is not. For now, stick with Shon Harris and James Stewart’s offerings. This book is widely regarded as an excellent resource for last minute studying, a final cram to use in the days just before you take the exam. It is concise, direct and an all-around easy read. The last update to this book was published in 2013 so it still reflects the old exam structure. An updated 3rd edition is scheduled for release at the end of 2015. Cybrary offers a free online course that maybe helpful to listen to while driving in your car. This is a terrific study guide with practice quizzes that is available for both Android and iOS. If you are looking for a CISSP training course, please check out what we have to offer.